It wasn’t the biggest news when talking about the Toronto Maple Leafs, but it came as a surprise. Yesterday, the Leafs put backup goalie Jhonas Enroth on waivers. The #leafs have placed Jhonas Enroth on waivers. For some, this move was inevitable, while others viewed it as premature. The Leafs signed Enroth to a one-year $750,000 deal to play behind Frederik Andersen. This was a great signing by the Leafs. Enroth had a good track record as a backup and was coming in on a cheap deal. Now after just four games, the Leafs have given up on Enroth. A chance to work through it is all Enroth needed. Instead he was waived after starting four games and coming in as relief in two games. Enroth didn’t play well by any statistical measurement since he allowed 15 goals in those four games. The game logs for Enroth are uninspiring and would make waiving him the sensible thing to do. In six games, Enroth had a 3.94 goals against average and an .872 save percentage. Those stats are far from his career GAA (2.84) and save percentage (.909). Now with all that said, why did Enroth need a chance? Coach Mike Babcock believed in letting Andersen work through his troubles when he struggled in October. Make no mistake, Andersen didn’t play well in the first seven games. He let in bad goals and was playing, uncharacteristically, aggressive. His struggles were only worsened by playing for a new team and adjusting to the Leafs system. Then there’s the terrible defensive play in front of Andersen that isn’t reflected in his stats for those first few games. But he worked through it and has since been fantastic for the Leafs. The reason Enroth wasn’t given the same chance is because he’s a backup goalie. The role of a backup goalie is difficult and has high expectations. Backup goalies are expected to sit on the bench for most of the season while being ready to play at a moment’s notice. They are expected to come in and play well in the few games they play each month. Anything less isn’t acceptable, it’s just the nature of the role. It’s an unfair situation to put a goaltender in, but it is part of the role. Enroth hasn’t played well, but he didn’t play as bad as his numbers would suggest. Most of the blame should be put on the rest of the team for not supporting him. Oct. 20 versus the Minnesota Wild ended with a 3-2 loss. That was Enroth’s first game of the regular season and he played well despite the loss. Minnesota’s first goal was on a breakaway. Enroth should’ve had the second goal as it just went past his shoulder. And the third goal was the result of Eric Staal spinning and shooting into the bottom corner of the net while a Wild player was left alone to screen Enroth on the shot. Oct. 30 versus the New York Islanders ended with a disappointing 5-1 loss. This was a total mess of a game for the entire team. A few of the goals were the result of Enroth’s bad play and a few were the result of the rest of the team being out of position and not covering the right player. Nov. 23 versus the New Jersey Devils ended in a 5-4 shootout loss. Neither Enroth nor Cory Schneider played well in that game with both allowing four goals each. Enroth finished with a .867 save percentage and Schneider didn’t fare any better with a .871 save percentage. In the shootout, each team went three times with only the Devils’ Jacob Josefson scoring. Nov. 30 versus the Calgary Flames was a sad 3-0 loss for the Leafs. The Flames got the jump on the Leafs with a goal in the first minute of the game with Freddie Hamilton scoring top shelf on a one-timer. The second goal was also in the first minute of the game with Kris Versteeg being left open to score on a rebound. Finally, the third goal was tipped in by Matt Stajan off a pass from Michael Frolik. The Leafs decided to show up after the first period and put 39 shots on Flames goalie Chad Johnson, which ended with the Flames shutting out the Leafs. So what’s the takeaway from that four-game review? Well, Enroth just played okay. 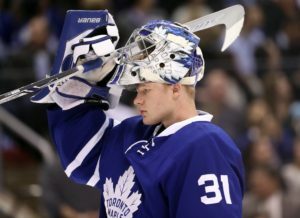 He seems reliable in making the first save, but gives up big rebounds that the rest of the Leafs can’t track down. Enroth wasn’t properly supported defensively by the rest of the team with many goals being the result of poor positioning and awareness from the defense. Now this all comes back around to the problem for backup goalies and the tough starts they’re given. Every single game that Enroth started was the second game in a back-to-back set of games. That means the Leafs came into each game tired from a game the day before. With Enroth on waivers, it means the Leafs are in need of a new backup goalie. For now it looks like Antoine Bibeau will temporarily fill that role, but Karri Ramo looks like the Leafs’ target as the backup goalie. Ramo has practiced with the Leafs while he recovers from a knee injury and he almost looks ready to play. So if the Leafs do intend to sign Ramo, then what can you expect? Well, Ramo has a career goals against average of 2.85 and a career save percentage of .906. That puts Ramo around the same as Enroth in terms of goals against average and save percentage. The major difference between the two is their height with Ramo at 6 foot 2 and Enroth at 5 foot 10. If Babcock keeps the starts for the backup goalie as the second game in back-to-back games, then don’t expect Ramo to do any better than Enroth. Ramo will have the same lack of support defensively unless the Leafs can change how they play in front of their backup goalie. Update: Enroth has cleared waivers and Ramo has been signed to a tryout contract by the Toronto Marlies.